Leaving your little one at home with a babysitter can be a very scary and anxiety causing event. I know it took me a long time before I was comfortable leaving my children with anyone other than a friend or family member. I always felt that no one would look after my children as well and with as much care as I would.I fretted over what would happen if they needed me at bedtime, would they be inconsolable, would they feel abandoned, would the babysitter be gentle enough (in nature) to sooth my youngest in my absence? Of course, as they got older and therefore became more independent, I felt more comfortable that they could express themselves and make their needs known. Once my youngest reached 4 years old, I finally felt better about leaving my brood with a sitter. For my own peace of mind, I put together a little survival kit. It contains everything I think is important for a sitter to know. So though I may have discussed verbally my requirements, she had a reference to look at about routines, emergency procedures and other info I felt might make her stay and the children’s experience a better one. Put the following items in a small basket or tub. I usually leave Children’s Nurofen or Calpol handy with a note to call me first before administering any so that we can talk through what the problem is. If it is something simple like a toothache, then I will say yes, but if it is a fever or vomiting, then that means an end to my evening out. This is a good thing too, if your child requires routine medication that you will be unable to administer yourself. Perhaps a couple of Plasters or antiseptic creams for accidents resulting in minor injuries. I like to give the sitter a general idea of bedtime routine. Listing tooth brushing, story time, bedtime, lights out times etc. Obviously I don’t expect these be adhered to strictly unless it is a school night. The reason I find this a helpful tool, is that I have 3 children and they have varied lights out times. My youngest has his 30 minutes before my eldest for example and it can be tricky for a sitter to remember the different timings and we all know that bedtime can be overwhelming even when they’re your own kids! I also like to tell the sitter more specific information about any fears, night lights etc that my children may have so that they can prepare for it if it happens. Take a moment to direct them to what board games they like, video games, devices and where to find these items. Now I am pretty sure my children are capable of finding their own toys but it is sometimes nice for the sitter to be able to say “hey, let’s play this…” without having to ask them where everything is. I always include a sheet with my number, my partner’s number, where we are (including a landline telephone number in case of poor reception), my designated friend’s number; someone local who is prepared to pop over to help if needed or if for whatever reason the sitter cannot get through to my mobile phone. I also make sure that I have the sitter’s number in my mobile phone so that it is easy to contact her, if we are running late, or had a delay for any reason. You just never know if there will be a power cut while you are out. 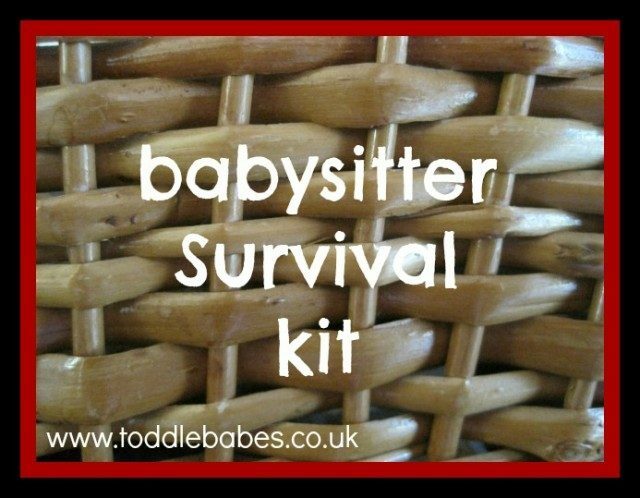 Having these items handy can save the children and the sitter a lot of stress. Make sure you have matches for the candles and check that the torch batteries are working. My children all have their own torches in their rooms too, so we make sure they know where they are and that they’re not in the bottom of some drawer where they won’t be able to find it in the dark. Every home has different sets of remote controls and pin codes for the television. I write down the codes to enable her to watch more grown up programmes- our television is restricted to needing a pin for anything over age 12 (age of babysitter dependent, although mine are always 18 or older) once the children are asleep. Instructions for the Wii, PlayStation or other gaming devices are helpful too. I also leave instructions for the oven as I have found that some sitters like to bring a pizza or something to reheat for their meal. I let the sitter know where I keep paper towels, wipes and other mopping up equipment so that should there be a spillage, she can easily clean it up. Treats and maybe some food? Sometimes I leave a meal for my sitter- this will be pre-arranged , especially if we are leaving early for an occasion and it’s likely she won’t have had her evening meal yet. The meal won’t be in the basket though! Otherwise I may include sweets, crisps or chocolates and other snacks that she can help herself to. Putting treats in for the children is also helpful-especially if your sitter finds the need for bribery or a little reward. Update: Now my children are older, I get them to choose the games and treats so that they are involved in some of the decisions for the evening. Ready, set, and out you go! I have found that this taking the time to put this little survival kit together not only makes me feel better about leaving the children at home whilst I am out, but is appreciated by the sitter too. It provides me with the knowledge that the sitter is prepared for every eventuality and in turn, the sitter feels more in control and able to handle whatever could potentially happen. I hope this has given you some resolve and peace of mind, to get yourself out of the house again.